1. Botswana. This low-budget South African destination worthy ranks first. This "jewel" boasts a good social climate, stability, and versatility. Suitable destination for wealthier tourists and for those with limited resources. Botswana round to offering many interesting attractions and entertainments. 2. Second in the ranking is Japan. In the capital of this country - Tokio- has already begun preparations for the Olympic in 2020. To this add and speed recovery of the economy, the depreciation of the yen and the combination of modern appearance and a small culture. All that Japan ranks second in the top 10 most popular destinations in 2016. 3. The US is number 3. Numerous events, new investment in infrastructure, entertainment, improvements ahead of the parks in the US. This is due to the fact that 2016 marks the 100th anniversary of the US National Parks Service. Do not miss it! 4. Fourth place captures Palau. How exotic sounds. In the republic includes 250 islands located in the Caroline Islands or just in the western part. 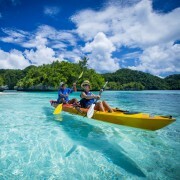 Although only eight of the islands are inhabited, the destination attracts with water aktraktsii and entertainment. 5. Latvia - Baltic country with ancient forests, hiding thousands of ruined mansions and castles. Art nouveau architectural style can be seen in the capital Riga. Also there you can see and transformed into a museum citadel former KGB. 6. At number six is ​​krasirana Australia. Plenty of sites offer you this country - the Great Barrier Reef, wildlife, national park "Kakadu". And these are just some of the attractions that attract many tourists. 7. Poland is number 7. In 2016 Wroclaw will be the European Capital of Culture, and next year is expected to visit Krakow and the Pope. Managed to avoid recession, the country became one of the top destinations of 2016. 8. The ranking puts 8th position Uruguay. As a serious alternative to its neighbors - Argentina and Brazil, the country expects more than 3 million. Tourists in 2016. 9. Greenland has the second. You've heard of Seve glow - there can enjoy it. If you're ready for your mobile phones lose connection to travel with dogs in harness, pack your bags for the largest island. 10. Finally in the ranking of the top destinations of 2016 is Fuji. This island darzhavas is in Melanesia, Oceania and consists of 318 small islands and two large. Diving, flaytbording are part of the entertainment you can experience there. Flaytbordinga- hit among water entertainment, allows you to do somersaults water are flying 10 meters above the water, dive like dolphins and many others. Get ready to pack your bags because these 10 attractive destinations await you!